If you don’t like the idea of having to wear glasses to see clearly, you’re not alone: About 45 million Americans prefer to use contact lenses to correct vision. But while contact lenses are a safe, effective, and convenient way to remedy a variety of common vision problems, they can also cause eye infections when they’re not worn as recommended or cared for properly. Here at Dr. David R. Frazee in Richardson, Texas, we want to make sure that our patients who wear contact lenses develop healthy habits to help them avoid the pain, irritation, and inconvenience of an eye infection, as well as the potential long-term vision damage. Getting yourself into the habit of washing your hands before you put your contact lenses in or take them out is the simplest and most effective way to reduce your eye infection risk. When you don’t wash up prior to touching your contacts, the germs on your hands easily transfer to your lenses and lens case. Effective handwashing requires lathering soap on moistened hands — including on the backs of your hands and between your fingers — for 30-60 seconds. It’s also important to dry your hands with a clean, lint-free towel after washing. Keep your contacts away from water whenever possible. This means you should avoid wearing them when you go swimming, use a hot tub, or take a shower. 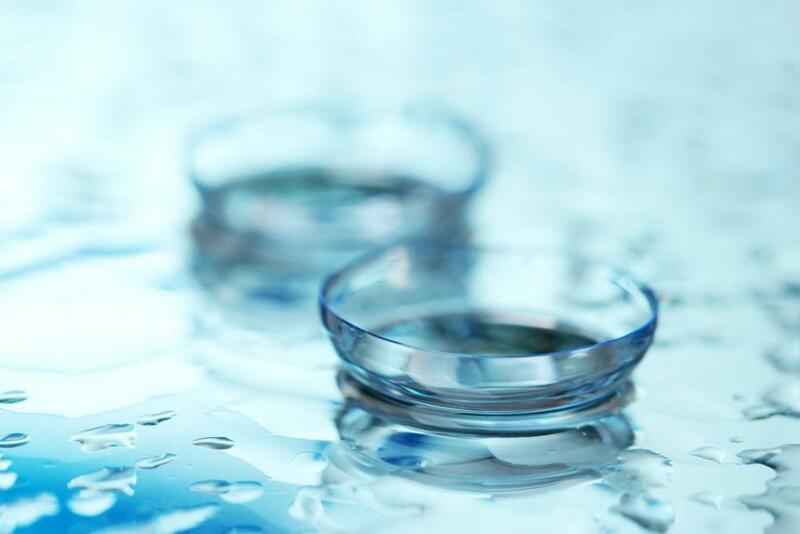 Wearing contact lenses in any type of water, even chlorinated water, increases your risk of contracting a severe eye infection called Acanthamoeba keratitis, which is caused by a free-living amoeba commonly found in water around the world. Although this type of infection remains relatively rare, it’s very painful and can be difficult to treat. In some cases, it may even cause blindness. Sleeping in your contacts significantly increases your risk of getting a serious corneal infection called microbial keratitis. Even if you use extended wear contact lenses that are approved by the FDA for day-to-night wear, don’t leave them in while you snooze. Sleeping in any type of contact lenses boosts your chances of developing an eye infection. In fact, studies show that people who wear their contacts to bed are up to eight times more likely to develop microbial keratitis than those who take them out before sleeping. Contacts require daily cleaning and care to stay clean and keep your eyes healthy. Many contact wearers believe that rinsing them in a disinfectant solution and soaking them overnight is the best way to clean them between each use. But studies show that the most effective way to remove microbes from your contacts is by placing them in the palm of your hand with some fresh, store-bought solution, rubbing them clean with the tip of your finger, and then rinsing them with a store-bought disinfecting solution. For the same reason you shouldn’t swim or shower while wearing contacts, you should never store your contacts in water or use water. Don’t use homemade saline solution to clean your contacts either. Your contacts won’t stay clean if the case you store them in is dirty. Cases that aren’t cleaned properly can form an invisible layer of biofilm that may become a breeding ground for germs. You can keep your case clean by rubbing and rinsing it with fresh, store-bought lens solution. Make sure your wash your hands before you begin, and just as you wouldn’t use water to clean your contacts, don’t use water to clean your case. After you dry your case with a clean, lint-free towel, store it upside-down, with its caps off, until the next use. When you store your contacts, you should only use fresh, store-bought solution. Mixing fresh solution with used solution reduces its germ-killing power and increases your risk of infection. Even if you take excellent care of your contacts, you shouldn’t try to extend their life beyond the amount of time that’s recommended. People who don’t replace their contact lenses when they should are more likely to experience discomfort and complications -- and in some cases, poorer vision. Replace your lens case at least every three months to minimize your risk of infection. That’s because, even with proper cleaning and care, your case can still become contaminated with microscopic germs over time. To learn more about the steps you can take to keep your eyes healthy and infection-free while wearing contact lenses, call our office or book an appointment online.